Recipe by: Paul Cote Jr.
"This recipe is a combination of a couple scampi recipes I have used, mixed with a little creativity. It's a creation that 3 family members and 2 close friends have clearly stated to never change again. Now they want the recipe. Please enjoy!" Bring a large pot of salted water to boil over high heat. Bring a large pot of lightly salted water to a boil. Cook linguine at a boil until tender yet firm to the bite, about 11 minutes. Drain. Melt butter in a saucepan over medium-high heat. Add onion, white wine, lemon juice, Dijon mustard, garlic, Worcestershire sauce, parsley, salt, cayenne pepper, and black pepper; cook and stir until sauce is combined, 3 to 5 minutes. Arrange shrimp in a flat layer in a shallow baking dish. Pour the sauce over the shrimp and sprinkle Asiago cheese evenly over the top. Bake in the preheated oven until the shrimp are pink, 12 to 15 minutes. 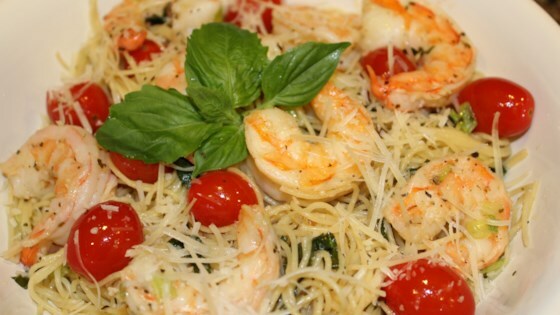 Serve shrimp and sauce over linguine. Be sure to spoon equal portions of butter sauce over pasta. I have also swapped the Asiago for some hand-shredded Romano and Parmesan (50/50 mix) and completely enjoyed the meal. I loved this recipe, so simple yet so elegant! I added in some cherry tomatoes and parmesan cheese! Great to serve for company!